Deadens Sound - Say Goodbye to Noise! Years in development and finally ... an affordable sound deadener that's clean and easy to use! TPM - solves noise problems in new and old vehicles. Apply inside the trunk, on floorboards, in quarter panels, etc. TPM also seals small holes that can let moisture in. Plus it keeps the interior temperature constant by preventing hot/cold air from entering or exiting the vehicle. It also reduces rattles and vibrations. Waterproof. Material is 45 mils thick (almost 1/16"). Can be doubled for extra protection. TPM is extremely flexible - can be easily pushed, stretched, or pulled into position, especially helpful with irregular interior contours and surfaces. 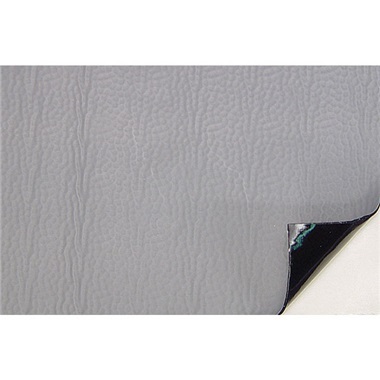 Slightly embossed, ad-free material makes drawing and cutting patterns a breeze. Easy-to-apply adhesive backing sticks to any clean surface. 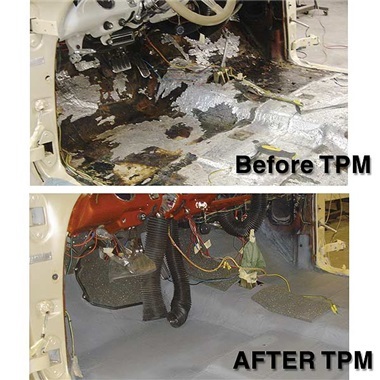 You'll love the convenience of TPM - a must for any restoration! Made-in-USA TPM Benefits and Cost Savings! Use inside trunk, on floorboards, firewalls, quarter panels, speaker enclosures, under dash, etc. Easy to install - apply in 3 easy steps: draw your pattern on TPM; Cut or trim TPM with scissors or razor knife; Peel off backing and apply TPM to vehicle! Gray Surface 3Ply. Available in 4 sizes below.